Sea animals fascinate us because of their unique coloring and design. But have you ever thought about why they look this way? Elizabeth Cook and Robert Yin show us some of these unusual sea creatures in their natural habitat, as they attempt to hide and sneak. Avoiding predators is a key to survival, and an animal’s ability to blend in with its surroundings can mean the difference between life and death. Predators also need to go unnoticed, in order to sneak up on their prey, so their coloring is intended to assist them. In these beautiful close-up photos, we see how these creatures sneak up on others as they try to eat, or hide to avoid being eaten. 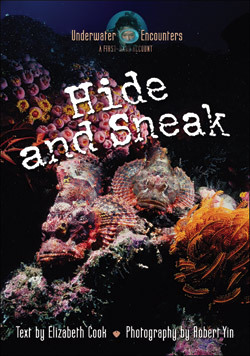 Hide and Sneak is part of the Underwater Encounter series, designed to deliver intriguing facts and first-hand accounts from the depths of the seas. This colorful and interesting book provides detailed explanations of underwater camouflage with great photographic images to illustrate these points. I highly recommend it for classrooms and libraries.